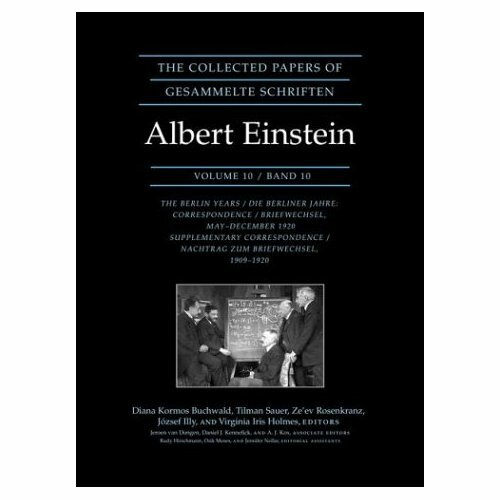 The 10th volume of The Collected Papers of Albert Einstein is being released this week by Princeton University Press under the editorship of the Einstein Papers Project at the California Institute of Technology. The Collected Papers of Albert Einstein is a collaborative project with participants from several countries. These volumes are edited by Diana Kormos-Buchwald, a professor of history at Caltech; Tilman Sauer, a senior research associate in history; Ze'ev Rosenkranz, Jozsef Illy, and Virginia Iris Holmes, members of the research staff in the Einstein Papers Project; and by associate editors Jeroen van Dongen, Daniel Kennefick, and A.J. Kox. 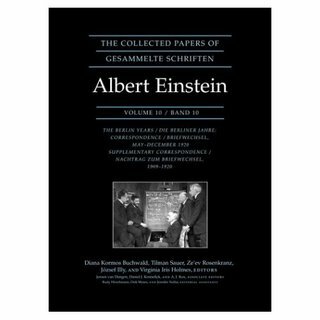 Volume 10 contains Einstein's correspondence from May to December 1920, as well as a substantial number of previously unavailable letters from 1909 to 1920, most of them written by Einstein. These originate from the bequest of family correspondence deposited at the Albert Einstein Archives at the Hebrew University in Jerusalem by his stepdaughter Margot Einstein, who stipulated that they remain closed for twenty years after her death. In the latter half of 1920, Albert Einstein faced a series of increasingly acrimonious public attacks against his recently confirmed theory of general relativity. He considered leaving Berlin, which would have deprived Germany of its most famous scientist. Colleagues, friends, and unknown admirers offered support, while Einstein worried about the care of his two sons and ex-wife in Switzerland, and his new family in Berlin. Scientific issues are discussed in the correspondence as well, shedding light on his associations with fellow physicists in Europe and the United States, and his lectures on the special and general theories of relativity within Germany and during his trips to Holland, Denmark, and Norway. The documents present the challenges Einstein faced as a result of his recently acquired celebrity status, his subsequent entrance into the public arena, and the contentious public attacks against relativity. The intensity of this period, during which anti-Semitism and nationalistic sentiment seeped into scientific debate, is reflected in numerous letters. The successful completion of the intricate process of Einstein's appointment as Special Professor at the University of Leyden leads to his well-known inaugural lecture on "Ether and Relativity" in October 1920. The letters document in detail his sojourns in the Netherlands, the hospitality of many Dutch colleagues, his involvement with issues at the forefront of physics, and especially his significant intellectual and personal bonds with Paul Ehrenfest. He visits Oslo and Copenhagen, where he meets with Niels Bohr, and receives invitations to America. The hardbound copy costs $110. The paperback copy costs $45.